American rabbi; born at Rebrin, Zemplén Comitat, Hungary, Sept. 25, 1872; educated at the College of the City of New York, at Columbia University (Ph.D.), and at the Jewish Theological Seminary, New York. 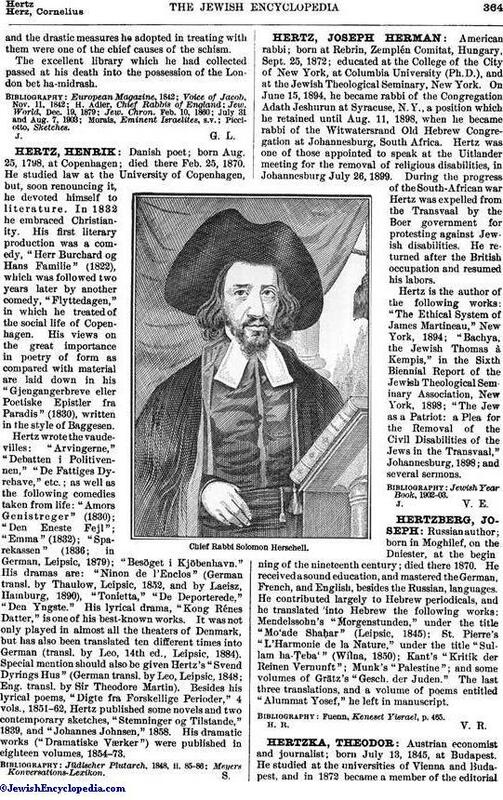 On June 15, 1894, he became rabbi of the Congregation Adath Jeshurun at Syracuse, N.Y., a position which he retained until Aug. 11, 1898, when he became rabbi of the Witwatersrand Old Hebrew Congregation at Johannesburg, South Africa. Hertz was one of those appointed to speak at the Uitlander meeting for the removal of religious disabilities, in Johannesburg July 26, 1899. During the progress of the South-African war Hertz was expelled from the Transvaal by the Boer government for protesting against Jewish disabilities. He returned after the British occupation and resumed his labors. Hertz is the author of the following works: "The Ethical System of James Martineau," New York, 1894; "Bachya, the Jewish Thomas à Kempis," in the Sixth Biennial Report of the Jewish Theological Seminary Association, New York, 1898; "The Jew as a Patriot: a Plea for the Removal of the Civil Disabilities of the Jews in the Transvaal," Johannesburg, 1898; and several sermons.